It is understandable being coastal that we at Shepard Insurance work diligently to be experts on water damage losses, flood zones , and then flood insurance coverage. Some may call it a bit of an obsession. Did you know that water levels in Connecticut have risen by five inches since 1964? The rise in water levels is measured by satellite every six minutes. 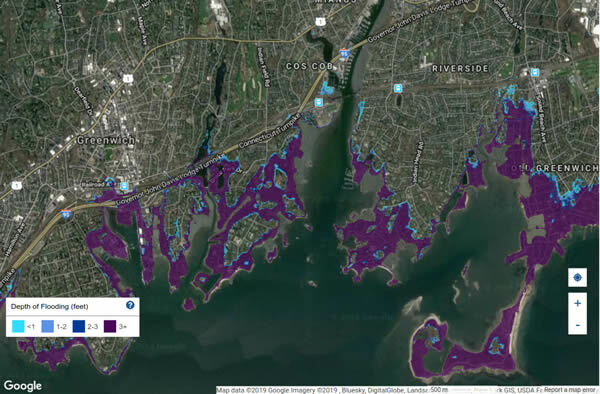 There are 7,000 properties at risk in Connecticut and we are told there is $2 billion in state monies set aside for “sea level rise solutions”. Our obsession has led us to two highly informative websites, which may have value to realtors as those icebergs melt. Take a moment to check these sites and we hope they have value for you in meeting the needs of your clients. If you need help sorting out new or existing flood coverage for your client’s–contact Kyle at Shepard Insurance Group. He is an expert on water damage exposure. Kyle’s extensive sales and account management expertise transcends both Commercial and Personal Lines. Coupling that with his finance and life insurance licenses, Kyle serves as full service insurance agent for all of his valued clients. The goal for Kyle is to provide tailored risk management to address his client’s current and future exposures, and to optimize wealth preservation.